Today’s post comes from Graeme Blake, a 177 scorer and professional LSAT tutor. 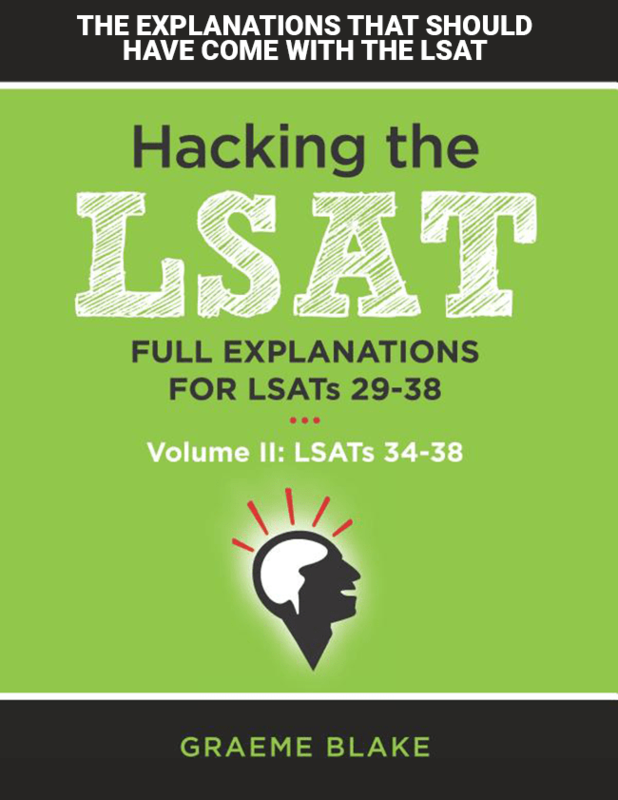 Having made some of the best LSAT explanations on the market, Graeme knows his LSATs cold. To help you crush LSAT, here is some of the key LSAT knowledge Graeme picked up from creating thousands of LSAT explanations. The LSAT is tricky, no doubt about it. But there are patterns. You’ve surely noticed this when taking timed sections. Sometimes you can’t quite put your finger on it, but you notice things that feel familiar. Of course, when you only see a small volume of questions, there are things that escape your notice. I’ve looked at far more LSAT questions than any human should expose themselves to. 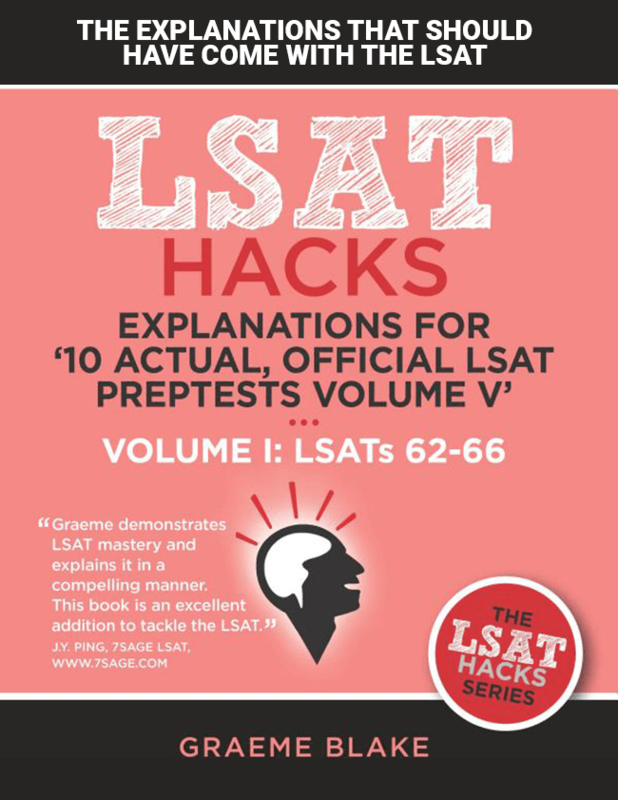 I’m the author of the Hacking the LSAT series, and the creator of LSAT Hacks, a site of free explanations for the LSAT. While making these (and a couple other sets of explanations), I’ve explained over 2500 LSAT questions. When you look at that LSAT questions, in depth, you can’t help but notice things. Here are the five most surprising things I’ve learned. I didn’t think this was true. But the more I look at logical reasoning, the more I realize that you must know what the different question types are asking you. And I mean really know it. Each question type has a strategy that works best. Knowing these strategies, cold, is what separates those scoring 165+ from those scoring lower. I find far too many students haven’t taken the time to internalize what each question is asking. Do you have problems with “assumption” questions? Well, first of all, if you say “assumption questions”, then you’re not distinguishing between sufficient and necessary assumption questions, which are completely different. Second of all, for necessary assumption questions you probably haven’t intuitively understood the idea of a negation: making the answer untrue in the slightest way possible. Most students fail to do this correctly. Flaw questions difficult? My guess is you don’t understand the answer choices, and you need to take time on review to come up with examples for the most common flaw questions. I could go on, but this blog post is too short for a thorough review. Suffice it to say, if you don’t fully understand what you should be doing for each question type, you will go slower than you ought to, and make more mistakes. If you made any of the mistakes I listed above, or if you ever hesitate about what a question is asking, you need to work on learning what each question type demands of you. Reading comprehension is by far the dullest section to explain. By far. Have a look at some sample explanations. These answers are from a couple questions in PT 70, passages 2 and 3. (Don’t worry, they won’t spoil anything if you haven’t done the tests). A. Lines 19–23 indicate that social scientists largely ignored dance. So the ‘peers’ wouldn’t have had an opinion on whether dance was interpreted correctly or incorrectly. B. Lines 26–27 explain why dance experts didn’t study dance ethnology. It was because they weren’t trained in social science. It had nothing to do with being preoccupied. B. Lines 33–42 indicate that people would call skydiving voluntary in order to avoid spending money to make it safer. D. CORRECT. Lines 25–27 say this directly. If you know what’s going on in the passage, and if you know the right section to check if something was mentioned, you can avoid choosing wrong answers. Now, I know what you’re thinking. You say that you know the answers are in the passage, but you don’t have time. Ah, time, we never have enough. Well, the students who score perfect on RC have enough time to check. I’d say they have enough time because they check. It’s so easy to overestimate how much time it takes to look back to the passage, and to underestimate how much time you waste staring blankly at the answers. I do teach people to read faster, but most students who score perfectly on reading comprehension read at an average speed or only slightly faster, and they have exactly as much time as you do! Most students can learn to refer back to the passage in 1–2 seconds. This isn’t hard. If you do the upfront work of understanding the passage’s meaning and organization, you can know where facts would be mentioned. Once you know where facts are, don’t stare at answers and “think”. Thinking is not how you prove answers. You prove answers by looking back to the passage, saying “ah yes, it says it right here, line 32”, and swiftly choosing the right answer with 100% confidence. You can’t “think” your way to proving an answer. Thinking is not your friend. Only the passage can prove answers. On every one of my logical reasoning explanations, I identify the conclusion and reasoning (for the arguments). Yet I’ve noticed that many students who score below 165 do not do this consistently. This is a mistake. If you are 100% clear on what the conclusion is, you can avoid most trap answers. Do not underestimate what I mean by 100%. If you have a loose or fuzzy idea of the conclusion and reasoning, you will make mistakes. You ought to be able to bet your life that the meaning of the conclusion and reasoning is clear to you. But if you are able to do this, you will be amazed at how easily you can solve many argument-based questions, which are the majority of logical reasoning questions. Once you have the conclusion and reasoning clear, the next step on most questions is to ask: what is wrong here? And if you’re 100% clear, it’s usually also clear what’s wrong. When I’m writing an explanation, I find that once I’ve identified the conclusion and reasoning, I’ve done all the hard work. And I never move on to the answer choices until I’ve done this. On a hard question, I usually don’t get the conclusion + reasoning on the first try. Not a problem — I just reread and look for them specifically. This often helps me understand what a complicated argument is saying. 4. Almost all logical reasoning questions can be prephrased. Pre-phrasing means to form an idea of the answer, before you have looked at the answer choices. If you have identified the conclusion, reasoning, and flaw, then it’s usually simple to see what the answer might be. You probably can see that the flaw is “assuming a conclusion to be false just because the evidence is false”. Or you could call it “neglecting the possibility that a conclusion might be true, even if the evidence is flawed”. There are multiple ways to phrase this idea. The point is to have the gist of it in your head so you can look for the specific way it’s phrased in the answers. This technique is the key to going fast. You can then go quickly through all the answers looking for your pre-phrase. You might spend 15–20 extra seconds reviewing the stimulus, and deciding on a pre-phrase. But you’ll then save 45 seconds on the answer choices, because you know what you’re looking for. By the way, I never approach the answer A-E in that order. Instead, I read them all quickly, and eliminate those that are obviously wrong. I keep those that seem like they match my pre-phrase, or could be right for some other reason. This works on almost every LR question. If you read the answer slowly, you could get stuck on B, and waste 30 seconds before you reach E and realize it’s obviously correct. A warning: do not get overly attached to your pre-phrase. It should be obvious if it hits. Sometimes I read through all five answers and see that my pre-phrase isn’t there. I don’t freak out, or assume I made a mistake. There are multiple possible answers to some questions, so I if I don’t find my pre-phrase I just assume the test-writer explored a different direction than the one I considered. I then go back over all the answers I didn’t eliminate, more slowly. This happens rarely, but it’s important not to be stubborn about your pre-phrases. I see countless posts on Top Law Schools about the special definitions words have on the LSAT. What nonsense! I’ve closely examined over 2500 LSAT questions, and I can say with confidence that I’ve not found a single example of a word being used outside its normal definition. For instance, on preptest 71 there is a question that uses “psychic”. Most people who read that question thought psychic referred to mental powers. But “psychic” has a secondary meaning: of or relating to the soul or mind. The argument only makes sense if you take psychic to have this second meaning. Never get fixated on a single definition of a word. If you don’t know a word, it’s ok. Low scoring students get freaked out and panic if they see a word they don’t know. High scoring students know the LSAT is not a vocabulary test. They read around the mystery word and figure it out from context. Or they skip it and move on if the word doesn’t seem relevant to the meaning of the paragraph. As for the precise understanding of ordinary words: take the time to understand what the words really, literally mean. The LSAT is a very literal test. We say all kinds of things that are not literally true. Here’s an example of a few sentences that feel correct, but are not literally true. First, they’re all the same sentence. At least, they have the same logical meaning. Need and only if are synonyms. The second sentence also uses only if, I just split it up by changing the word order. Second, none of the sentences are true. There are a handful of law schools that don’t require the LSAT, or that make exceptions. For instance, McGill university in Canada does not require the LSAT, because it gets many french-speaking applicants. I wouldn’t go looking for American schools that don’t require the LSAT (all good ones do), but the point of the example is that if you interpret the word “only” literally, then it’s very difficult to make a true sentence using the word only. And on the LSAT, you have to use the proper, literal definition of words. So when the LSAT says “only”, then they mean business! The sentence has to be true 100% of the time, no exceptions. Likewise, “some”, taken at it’s least powerful, can just be “one”. I won’t go into why this is true grammatically, but on a strengthen question you must take “some” at its weakest. When I started writing, I had the vague idea that LSAT words were different. 2500 questions later, I changed my mind. I’ve decided that the LSAT uses words according to their normal definitions, and much research with my dictionary and grammar blogs backs me up on this point. The LSAT feels weird merely because it’s so precise. Just like….legal documents. So if you understand the precise, ordinary definition of words, then you’ll score better on logical reasoning. Graeme Blake scored a 177 on the LSAT, and has taught hundreds of students all over North America. He’s the creator of LSAT Hacks, a site with free explanations for the LSAT. 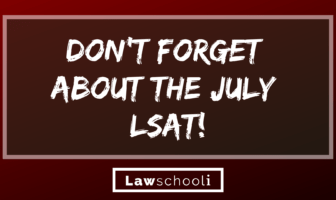 A 177 scorer and professional LSAT tutor who has also done curriculum development for 7Sage. 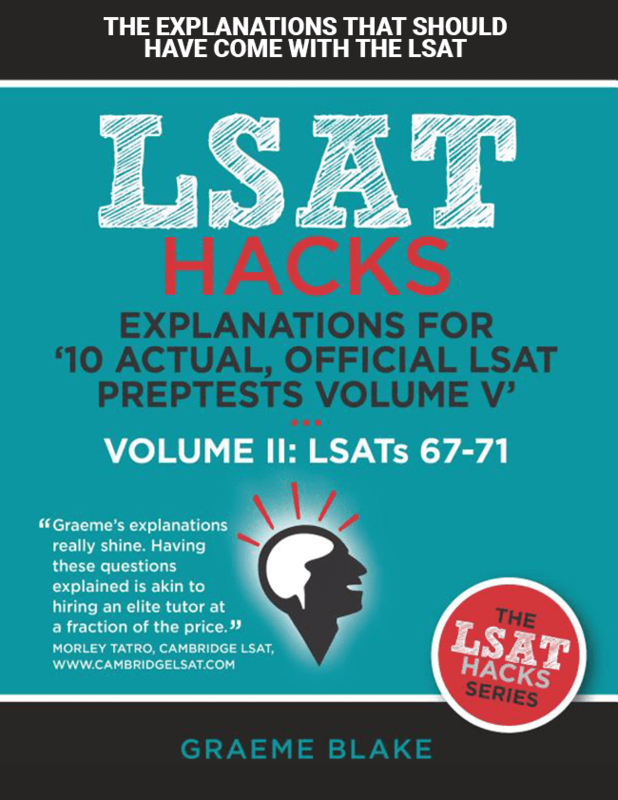 Having made some of the best LSAT explanations on the market, Graeme knows his LSATs cold.